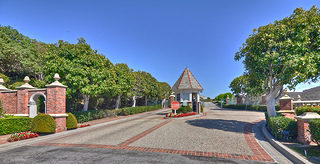 There are many gated communities in San Juan Capistrano that range from luxury gated communities like the Marbella Estates, the Hunt Club and Connemara By The Sea to more affordable gated communities with condos that can range below the $1000,000 mark - like the Marbella Golf Villas. Homes at Marbella Country Club have a guard gated entrance, and are the premier luxury neighborhood for those golf enthusiasts. A residence in a gated neighborhood offers the best of both worlds, combining privacy and easy access to all that you need. The properties, homes and condos shown below are those that are in gated, guard gated or require a gate code for access to the community. For more information about any of the homes, contact us at (949) 888-6788 or via email. Read more about Gated Homes in San Juan Capistrano. More and more people want to reside in gated residential communities and because of this, there's a lot of choices when it comes to your San Juan Capistrano Gated Home Search. Gated communities shown above are either controlled by gates, entry codes, key cards or security guards. Gated communities provide the perception of security, safety, and privacy. In affluent residential neighborhoods, privacy means exclusivity and therefore increased property values. Adding an attractive automatic entry gate system can easily add $50,000 or more to single family home values within some communities regardless of whether it has any effect on crime. Also note that usually when a home is in a gated community, there's also going to be higher HOA to maintain the gates, guards cost, etc. For additional information on these homes or a list of the gated communities in San Juan Capistrano please contact us. We are San Juan Capistrano Real Estate agents with knowledge of San Juan Capistrano Homes in Gated Communities and specialize in San Juan Capistrano and Orange County Real Estate. We look forward to assisting you. OCExecutives specializes in real estate transactions of gated homes, or homes in gated communities in San Juan Capistrano, California. Contact us today to sell real estate or buy real estate listed as 'gated' in the community of San Juan Capistrano or for more information about any of these gated homes. If you would like to see a list of homes in other communities in San Juan Capistrano including Marbella Country Club Estates, follow the links above, or click here for other San Juan Capistrano Real Estate.